I've been trying to take outfit photos for the past four or five days, but it just hasn't happened. Every day I made sure to wear something I'd want on the blog and I told myself, "I'm taking outfit photos no matter what." Then it would rain or I would be too sick to even fathom smiling for the camera. This stupid cold doesn't want to leave. Luckily, my friend Justine was nice enough to take these for me today after class when the weather was nice enough to allow me to wear a cardigan without dying. I've since taken it off, but it was nice while it lasted. I've decided that I don't wear this dress enough and that's a problem. This is probably only the second or third time that I've worn it since buying it, but I definitely plan on changing that. It doesn't help that I keep pushing items in my closet to the side because "it'll look better with tights." Doesn't everything? About these shoes: I'm obsessed. I've been wearing them with pretty much everything. For buying them on impulse after seeing the $12 price tag, they're sure going to prove their money's worth. They just go with everything. If you don't believe me, just wait until I insist on wearing them with everything I own. Once again, I should be working on an article instead of writing this. I'm writing my insanely long Breaking Bad recap for tomorrow's issue and I'm not quite sure I can do the show justice. Also, is it possible that I talk about Breaking Bad on here more than I do fashion? It's a healthy obsession, I swear. I'm not entirely sure that anything I've just written makes sense or has been organized in a cohesive manner. Excuse my while I go drown myself in NyQuil. Those shoes do go with ANYTHING! How cute are you!? This dress was made for you, such an Elana dress! Love it. Sorry that you've got a summer cold, that's the worst! Totally agree, everything does look better in tights and then we can layer and wear cardigans, comfortably! Glad you found some time for an outfit post. I loved this dress the first time, still love it! Hope you get all your work done, talk to you soon Elana! Anyway, glad you were able to pull out that dress again! Its so cute, you definitely need to wear it more haha. Although I agree - tights make everything look better. I'm dying for fall weather to arrive so I can start layering! I love the color of your cardigan, I'm kinda obsessed with green. That dress is really neat! Are those little buildings? So cool! And those shoes are super cute and such a steal!! Seriously I am so excited for the day I can finally wear tights again! Is it bad that I get overly excited for days with temps only reaching 70 because it means I can throw on a sweater and not look totally crazy?! I think not! Such a cute dress and I am obsessing over that green...and I may have a sweater pretty identical in color to the one you're wearing here...twins! Haha! That dress is adorable! I'm obsessed with the building print! Plus I love how you styled everything. You look great! love the shoes, but especially LOVE the dress. I just cant get enough of that print! The finale of Breaking Bad was sooo good, I can't believe we have to wait 9 months for the final season! Love the adorable building print of that dress and those shoes were a total score. I may have to stop by UO on my way home from work :) Love the backdrop for these photos as well. that dress is adorable! I love the collar on it and also your wonderful loafers! WHY DON'T YOU LIVE CLOSER?!?! i need to come steal this dress out of your closet - i'd of course lend you one - but yes - we would share closets. i'm deciding this now. i thought about buying this off of modcloth but because i was afraid i didn't - and seeing it on you! it's SO cute on you - the fit and color is perfect on you and it's such a cute find. and yes - this dress would look cute with tights but i like it like this. and that green sweater?! loving this all. I'm obsessed with cardi's! I have about 10 different colors and wear them constantly. Great outfit! Oh man, this dress is so cute! 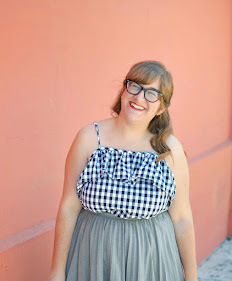 I just saw it over on Dus's blog and had to check out your post :) Seriously cute!